He could be called the Bossa Nova Le Corbusier. Adapting the International Style to Brazil, he was innovator in the use of reinforced concrete to create gentle curves and grand plazas. Oscar Niemeyer’s buildings have become icons of the Latin American country, so it is understandable why Cine Fest Petrobras Brasil chose to close the New York leg of the festival with Fabiano Maciel’s documentary Oscar Niemeyer—Life is a Blow (trailer here) last night at Central Park’s Summer Stage. Niemeyer was not just inspired by Le Corbusier, he collaborated with him on one of the world’s best known buildings—the UN Building. 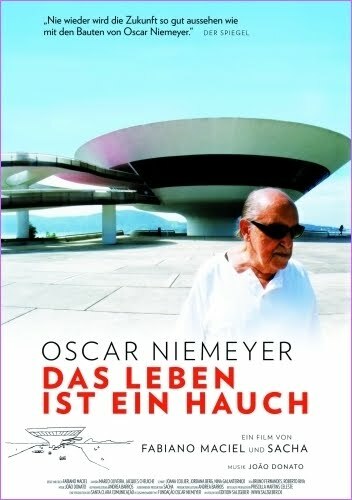 It really should have been Niemeyer’s gig alone, but he allowed the French modernist to worm his way into it. Though his work can be seen around the world, arguably his most important buildings are in the Brazilian capitol of Brasilia, including the National Congress and the Cathedral of Brasilia. While the wavy lines of Niemeyer’s structures might remind some viewers of Frank Gehry, the Brazilian’s curving concrete is more expressive and functional, never indulging in Post-Modernism for its own sake. Indeed, his use of mosaic murals demonstrates his connection to tradition and his desire to development a uniquely Brazilian architecture. 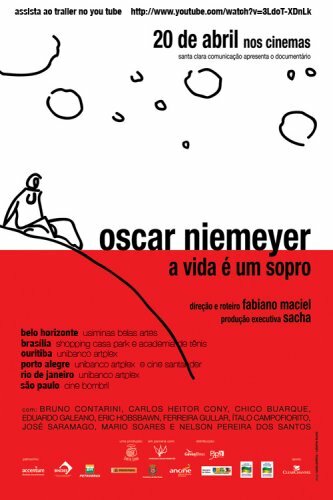 We hear quite a bit from Niemeyer in Blow, including some odd political diatribes that pass unchallenged by Maciel. Indeed, the architect seems have a marked preference for autocratic strongmen, which is perhaps understandable, considering how many of his commissions have come from government decrees. As one interview subject archly remarked: “Niemeyer has always opposed right angles and capitalism.” That may have worked for his career, thanks to his government patronage, but both are necessary in real life. Regardless of Niemeyer’s problematic Marxism (at a time when the world intelligentsia was well aware of the crimes done in its name), his buildings are incredible. Blow showcases them well, giving viewers a sense of the flowing spaces and character of his most important structures. It is effectively undersc ored by an original jazz soundtrack featuring the likes of João Donato and bossa guitarist Felipe Poli. Hip listeners would also be interested to see Chico Buarque appear in a non-musical capacity, speaking to Niemeyer’s relation to Brazilian artists in other disciplines. However, despite the power of its visuals, the cerebral nature of the film and the gentle sounds of its score might have been lost on some of the Summer Stage crowd. Respectful to a fault, Blow makes it clear the less Niemeyer is heard and the more his structures are seen, the greater viewer appreciation will be for his striking body of work. It closed a strong slate of films at Cine Fest Petrobras Brasil in New York, which now proceeds to Vancouver.